Since the late part of December 2007, a few of my work colleagues and I have started to come together for a morning prayer in our office. The construction industry has suffered a great set back lately with the slowing down of the real estate industry, and our company, being in the windows and doors business, is of course affected by it to some degree. We have seen many changes occur within the company in the last few months and I would be a hypocrite to say that I’ve not been affected. Seeing those changes take place have have created a feeling of uncertainty and insecurity inside of me. And I am pretty sure that my colleagues feel the same way too. So, this morning prayer happened just at the right time – a proper response, I would say, to a situation that is beyond any of our control. Needless to say, these prayer sessions are focused on the company we work for – for its management, business deals and decisions, its workers and for whatever special prayer concerns and requests that are brought up that day from any one of our colleagues. We pray for 5-10 minutes only as we do not want to encroach on company time too much. But though the prayers said are short and concise, I know that God honors them. And I believe by faith that He will use these prayer times to work His way into the hearts of our colleagues who do not know Him, or those whose love for Him have grown cold. The great thing is that the Lord is stirring my spirit! 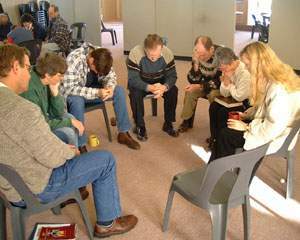 Every morning, I now find myself looking forward to these prayers sessions, to the chance of being able to relate with my office mates on a different level. I just believe that God is doing new and mighty things in our midst. It is such a blessing to be able to pray with my co-workers especially because religious activities of any kind in most work places here in the U.S. are a taboo. I thank God that I am working in a company whose owners are godly, Christian men. And I pray that indeed, this company will remain to be one that lifts up the banner of Jesus for the glory and honor of the Father, our God. on January 12, 2008 at 1:00 pm | Reply Holly L.
what a blessing to minister to your coworkers! while we did not pray or anything I was able to be a witness in my office and two of my coworkers came to know Him. So continue to do so, the littlest act, the smallest word can be a huge impact on those who don’t know him!! I will pray that your simple act of prayer (which isn’t so simple) will have a big response on those who don’t know him yet!!! You are such a blessing to us Jescel. Your spiritual strength is amazing to see and an inspiration. ey ate jes! in one of the words in elijahlist there was a prophecy about more prayer and intercession coming from the christians in the marketplace. check out elijahlist.com one of these days. i forgot who gave that word. thanks Holly… your comment is humbling to me, and i give back all the glory to Jesus, who is my strength. I do pray that these prayer times in the office would draw all my officemates unto the Lord! hahahaha! nameless faceless generation.LOL indeed!